SAVE publications can be ordered direct from the website. At the checkout, Friends of SAVE can sign in and benefit from their Friends discount. 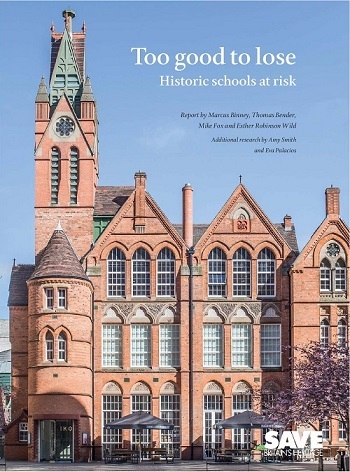 Our new report Too good to lose: Historic schools at risk was published on Wednesday 21st November. Our report looks at the alarming number of Victorian, Edwardian and inter-war schools at risk of decay and demolition, as well as some that have been saved, refurbished or converted for new use. SAVE Britain’s Heritage’s latest Buildings at Risk Catalogue, Revive and Survive, was published on 27 June 2018. It features over 100 empty and neglected buildings gathered from all round the country which need a fresh start to give them renewed life and to ensure their survival. These forgotten buildings include courthouses, theatres, shipyard offices, churches, barracks, a shopping arcade, a tiny welsh toll cottage, a house inhabited by George Eliot, several large country houses, pubs, town halls, factories and allotment huts. The pages of the catalogue are full of photographs of unknown or overlooked historic gems some huge, some humble. All have an individual story to tell and are just waiting for sympathetic restoration and reuse. To coincide with the RIBA exhibition 'Circling the Square', SAVE is offering copies of our 1984 and 1987 reports on the No.1 Poultry case for £10 (plus P&P). 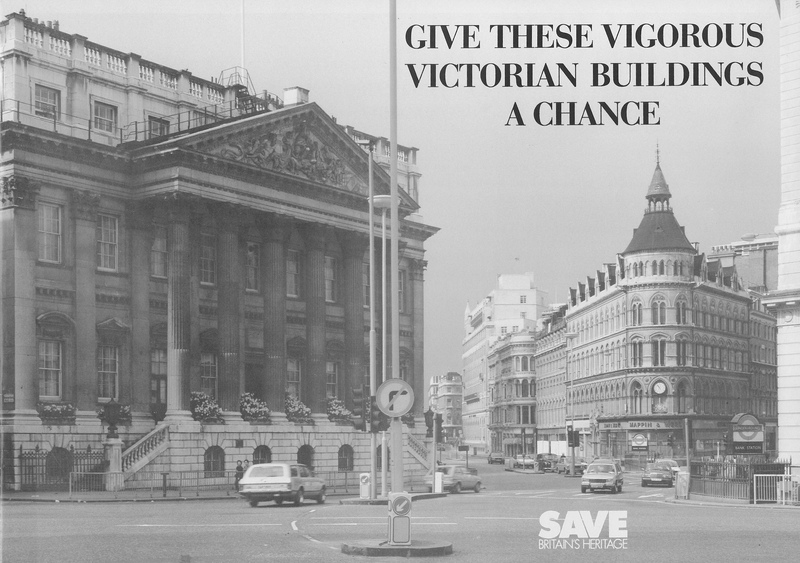 SAVE fought two major public inquiries in the 1980s to save the Mappin and Webb buildings from demolition, winning the first, but losing the second. 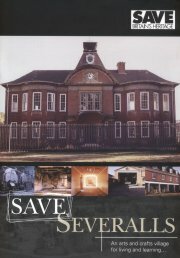 As part of SAVE's campaign several short reports and publications were produced, two of which are available to purchase here. The RIBA exhibition details the designs of the two proposals, and the campaigns to save the Mappin and Webb buildings. It runs until 25 June 2017, and is free to attend. More information here. Our 25th Buildings at Risk Catalogue 'Great Expectations' is a must read for anyone interested in restoring historic properties, with 100 buildings from across Britain in need of a new lease of life, inspiration from some of the most challenging cases, and plenty of practical advise. Spotlight articles include historic cinemas, the state of heritage in Northern Ireland, and a Buildings at Risk success story in Cumbria. This book shows how Britain has led the way in breathing new life into great historic buildings of many kinds - naval dockyards, military enclaves, textile mills, market halls, railways arches, air terminals, Victorian grand hotels, power stations, town halls and hospitals. These heroic transformations have often been the work of enterprising commercial and often voluntary organisations. Once repaired and transformed, sometimes after years of decay, they provide places to work, live and visit. More than this they are powerful regeneration projects in places which need investment. These successes can be an inspiration to everyone who cherishes a local landmark. Many of them are the direct or indirect result of campaigns and projects launched and commissioned by SAVE. These are buildings which half a century ago would rarely have survived. Their revival is a creative process showing that all over Britain and beyond, historic buildings can be beacons of new life in both booming and declining economies. Marcus Binney tells the stories of these rescues, often in the face of official indifference and even hostility, stories which are easily forgotten when a great building is restored to glory and life. When these buildings have been callously left to rot, some may need injections of grant aid, but once repaired they no longer need to be pensioners on the state but can earn their keep. This book is a blueprint for action showing that it can take just one determined person to save an architectural marvel. Working with John Burrell, from Burrell Foley Fischer Architects, SAVE has produced an alternative scheme for 154-158 the Strand, which were proposed for demolition by King's College London. We propose a new piece of public realm for the capital along the great processional route of the Strand, and bring the buildings back to life. A must read for anyone interested in heritage and an essential tool for prospective restorers, SAVE's new Buildings at Risk Report 'Falling In Love' showcases historic properties in urgent need of new owners or imaginative reuses, revealing an array of exciting opportunities. Hopefully you'll fall in love with the 100 buildings at risk featured. SAVE's latest publication marks 40 years since the landmark exhibition The Destruction of the Country House. Held at the Victoria and Albert Museum in 1974, the exhibition had a huge impact and led to the founding of SAVE Britain's Heritage in 1975. Read of the battle to save The Grange, the campaign to prevent the break-up of Mentmore Towers, and the problems currently facing houses in local authority care, amongst many others. A must for anyone interested in Britain's heritage and country houses. SAVE's new Buildings at Report 'Dare to Care' shines the light on historic properties in urgent need of new owners or fresh uses, revealing an array of exciting opportunities for restorers. This is the ultimate 'lonely hearts' list for buildings at risk. In 1985 SAVE published the report London's Churches are Falling Down, revealing the desperate plight of some of the capital's most beautiful places of worship. A quarter of a century on, SAVE revisits the subject with London's Churches are Fighting Back. As well as covering those churches currently at risk, this new report also recounts the many inspiring rescue stories, looking at how decaying buildings have been re-energised by new congregations or new uses, and kept alive by vital repair grants. This 120-page report, by Edmund Harris, features stunning new photography by Matthew Andrews. Edited by Bridget Cherry and Ann Robey. Published by SAVE with the support of English Heritage. London’s leafy suburbs form a giant garden city, of pleasant low-rise housing set amidst gardens and tree-lined roads. They fulfil the longstanding English dream of a house and garden in leafy surroundings and offer an impressive model for urban living. The sheer number of suburbs – north, south, east and west – provide a quite astonishing housing stock. Yet while most Londoners know their own suburb well, and perhaps its neighbours too, not many people know more than a fraction of the whole. This book is intended, like many other SAVE reports before it, to be a voyage of discovery. It focuses principally on planned suburbs and estates which have a particular harmony and sometimes a distinctive pattern of streets. 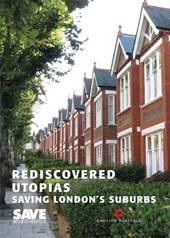 It looks at suburban housing built in different ways, by landowners and speculative builders, by voluntary associations and the boroughs themselves. Yet in many places the character of these areas is being constantly eroded, by small but accretive changes to details such as windows and doors, fences, gates and railings, roofing and paving materials. In many places, conservation area protection is not working as effectively as it could. More ‘Article 4’ directions are needed to control features that give character to suburbs. The lists of listed buildings are also seriously out of date in some London boroughs, with many architect-designed houses of the early 20th century still unlisted. The sum of all the best suburbs is more than the parts. While houses have a sense of individuality it is the harmony of whole streets and neighbourhoods which make the suburbs a delight. Colchester is one of England’s most overlooked historic county towns. It retains its Roman grid, with a castle, town walls and street after street of handsome buildings. 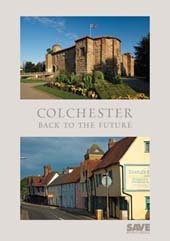 This report aims to highlight the wealth of Colchester’s built heritage, show the good work that has been done in conserving and augmenting these assets, and put forward ideas for the future - from the small scale to the highly ambitious. Central Brighton is home to a number of 19th-century churches of great size and beauty. This report by the late Thomas Cocke - with stunning new photography by Matthew Andrews - examines the superb but all too little-known interiors of these churches and warns that, with rising costs of repair and maintenance combined with declining congregations, the threat of closure looms for many. 95 pages, full colour, 100 illustrations. The beautifully illustrated book celebrating SAVE's 30th anniversary exhibition at the Victorian and Albert Museum in 2005 / 2006, telling the thrilling tale of SAVE's fights over the years. Published Nov 2005. A lightning publication from SAVE, with the aim of raising awareness of the importance of Farnborough to the nation's history. It looks at the remarkable collection of buildings that make up what remains of the former Royal Aircraft Establishment site at Farnborough and suggests new uses for the buildings and the site. Published December 2001/January 2002. A new report from SAVE, condemning the mass demolitions under the Office of the Deputy Prime Minister's Housing Market Renewal Initiative / Pathfinder. At current rates this will see the demolition of 168,000 terraced homes in the Midlands and North of England by 2015. Published 2006. * If you are interested in this, you might also be interested in Reviving Britain's Terraces, Life after Pathfinder (published 2010). This new, fully illustrated report looks at the situation faced by Severalls hospital and parkland. The booklet covers the beautiful and unique architecture of the wards and other site buildings, and the mature and spacious parkland. The booklet also outlines an alternative scheme that would maintain most of the buildings and parklands, and keep development to a minimum. SAVE's long awaited book on historic law courts is finally in print, with over 170 photographs, many previously unpublished, of the UK's historic courts - a remarkable group of buildings. The report looks at the problems faced by the buildings across the UK (with the PFI route of procurement being at the fore), as well as at those that have been successfully refurbished to meet modern expectations. SAVE's publication on the no. 1 Poultry site, written by Jenny Freeman, reviews the two-thousand year history of the Bucklesbury area, describing in deeper perspective than hitherto, the extent of the destruction now proposed. A lightning leaflet criticising efforts by the Diocese of London to sell the church of St Mark, Norty Audley Street to a hamburger restaurant chain. Published August 1986. Published in February 1986 in conjunction with the Victorian Society, this pamphlet champions the cause of the neglected yet magnificent St Albans church in Teddington, Middlesex. Chatham Historic Dockyard: Alive or Mothballed? A report providing detailed proposals for the re-use of the remarkable historic buildings of Chatham Dockyard. Published October 1984. Despite this report arguing for the historic station as a vital part of the railway conservation area, Derby Station was demolished in 1984. Institutions - Friends or Fiends? A short report published in July 1982, drawing attention to the large financial institutions to fund conservation projects. Alarmingly, in a large number of cities the clean sweep approach is making a comeback:; the report looks at Leeds, Liverpool and Newcastle. Published May 1982. 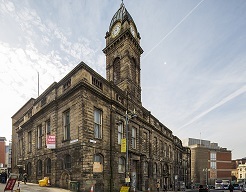 Comments on proposals for setting up a new commission for historic buildings. (English Heritage was established in 1984). Published February 1982. Nonconformist chapels are closing at an increasing rate. This report is a major survey of noncoformist architecture in the north. Published October 1980. A report revealing a disturbing picture of discrimination by building societies against older buildings. Published March 1980. Second SAVE report on buildings threatened by lack of statutory protection, with case studies of particular areas. Published April 1979. A report highlighting the failure of the present legislation to prevent large numbers of listed buildings from falling into decay, and giving recommendations on how the law could be improved. Published in the Architects Journal, 22nd November 1978. 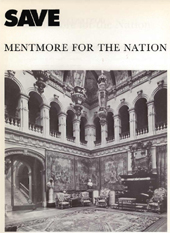 A booklet about the treasures of Mentmore Towers, published in January 1977 as part of SAVE's campaign to preserve the house and its contents for the nation. The collection was subsequently sold but the building remains at risk today. An illustrated report highlighting some 50 garden buildings - grottoes temples, menageries, bath houses, boat houses, tea houses, belvederes and gazebos - that were at risk in July 1987, the date of publication. An extensively illustrated (colour and b/w) book describing new uses for redundant churches and chapels, ranging from offices and housing to theatres and restaurants. The emphasis is on schemes that respect the character and integrity of the churches. Published September 1987. The sequel to The Country House To Be or Not To Be and Churches: A Question of Conversion, this is a fully illustrated colour guide to practical ways of re-using mills, warehouse, maltings and other industrial buildings. Features a number of architect's schemes. Published April 1990. A report focusing on the plight of urban schools in England and Wales, containing essays from leading figures in the field and over 100 illustrations. Extensive gazetteers give particular emphasis to those school buildings which are under threat of closure or have been converted to new uses. Published July 1995. The first comprehensive study of the current plight of Britains mental hospitals. These attractive and imposing Victorian buildings, carefully designed with extensive landscaped grounds, are now facing an uncertain future. By the year 2000, 98 out of a total of 121 will have closed. The report calls for tighter planning controls to be brought in to prevent the loss of both buildings and grounds to over-development. Published October 1995.